Words are all we have or proof? When you dare say something about someone, then you ought to be able to prouve it, no? The swedish barbet club has decided to publish a deceitful and misleading document. That is not right, culturally and ethically. If you don’t know about something you ask questions or you shut up. Why do I not want to use my dogs with “just” anything. I am working to get the Hermans Poodle out of my Barbets, not keep it in. So yes, most of us have Poodle in our pedigrees, I say most because until a certain point the old breed did not. I paid my dues and now I want to stay away from thin bones, bushy ugly coats, tall thin legged dogs, pointy noses, high ears, mouths too small to hold teeth…….. and snippy characters. Does that answer that? I hope so or I can also draw a picture and add sound. I select my dogs and the lines I accept to use them in. I am not in it for the money or it would be a known fact. Why fight for the survival of a breed when you can get a real cross? They are probably as widespread as the Barbet Moderne, or more…..and have in common the fact that they are recent creations. A bit of humour for Sunday? Do or die. 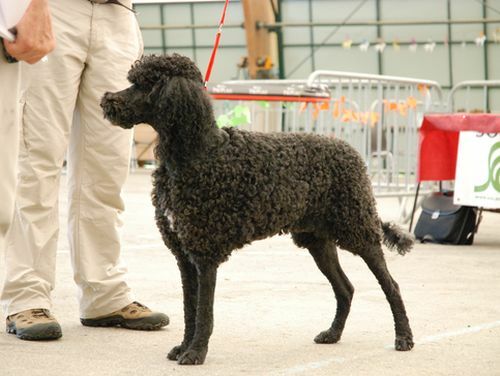 Depending on who is elected to “save our souls” on Sunday at the Marseille show where the ballots for the new committee members will be counted, will the Barbet resort to being the Poodle Jean Claude Hermans and several breeders worldwide promote? I guess we’ll have to see what the 2 working class entries look like. Entering a zone of great turbulence, we are! It is quite obvious that you can control 1 dog even off leash, but 4 is a bit different. One goes they mostly all go…That natural instinct is there. The place to be in September! Sorry it is in French but you will get the overall meaning. Definitely something to attend. H Räber says that “just” because a dog shows hunting instinct does not mean the line or the production will. There was an article published a while back in France about the Barbet being a gundog/ hunting dog. I have always been careful as to reponding to requests and info about that. Most of my dogs can do it, but I cannot gurantee it. The other drawback is the price: Gundogs are not “really expensive” dogs and not many hunters are willing to pay over 1000€ for a pup and then have to also groom them regularly. The coat is a very important factor here. If you can run a comb through the dog or if you spend 2 hours doing one leg? Since many only breed to obtain extremely curly coats showing no concern for character or hunting ability, well then, that takes care of that. Le comportement du chien et du chat expliqué par les gènes ? Une journée dédiée aux éleveurs pour en savoir plus sur la place des gènes dans le comportement de vos chiens et chats. Vos chiens présentent un tempérament plus ou moins spécifique de la race. *Vos chiens ont des traits de caractère particuliers, présentent des aptitudes au travail, à la chasse, à la garde des troupeaux, au mordant, etc. Les chiots que vous produisez héritent manifestement d’une partie de ces caractéristiques même si l’environnement joue aussi un rôle important. Quelle est la part de la génétique dans la détermination de ces traits comportementaux ? – le déterminisme et les modes de transmission. Les présentations allieront l’état des connaissances scientifiques avec des exemples concrets de lien entre comportement et génétique chez le chien et aussi chez le chat. Chaque présentation sera suivi d’un débat et de questions-réponses qui vous permettront d’exposer les situations que vous rencontrez dans votre élevage et de répondre à vos interrogations sur la sélection de ces traits comportementaux. * As I said recently on a social media, “how can anyone say the Barbet is this or that until they have had enough pups of their production grow up and perhaps even reproduce themselves before they can say what the Barbet behaviour is? Despite all the mixing of different breeds to make what we claim a Barbet is…….there are leaks now more and more about how there are temperament issues in some lines. The individual detaining most health issues hidden about several lines under control, is having difficulties hiding these issues. I think it’s about time…Accusing the Barbet of being this that or the other whilst discussing dogs with of no ancestry , pure Poodle or PWD crosses, and pointing fingers is hardly an argument expect for the useful idiots who work closely at accusing dogs they know nothing about. No names, but the people concerned know who they are. Thelma had not been in water for several months since the weather has been so awful, but I thought today she would enjoy going out there. We took Vennie so she would watch and learn…Thelma aboslutely adores retrieving and she knows where we are going depending on which way we turn when we leave the house…. You want to sell the merits of a Barbet? Show videos and take your sound off. They can sell themselves better than aided by human arguments. What a shame to see that nowadays ( a word I hate to see my students use, as if they had been around before…) breeders try to sell dogs with arguments that are of no use to convince a “normal” person!